Team Nigeria’s conquest for medals took a dramatic turn on Day 2 of athletics at the Hampden Park in Glasgow as Nigeria’s No.1, Folashade Abugan was the only one of three athletes to qualify from the semi-finals of the women’s 400m at the ongoing Commonwealth Games, through to the final on Tuesday night. Abugan competed in Heat 2 of the semis, and missed out on automatic qualification as she finished third behind Jamaica’s Christine Day (51.02) and Shaunae Miller of the Bahamas in 2nd with 51.58s. However Abugan’s time of 51.71s qualified her as one of the fastest losers, along with Kineke Alexander of St. Vincent and the Grenadines who posted 52.12s behind Abugan. Folashade Abugan at the World Relays in the Bahamas. She is Nigeria’s 400m Champion in 2014, winning at the Nigerian National Championships in 51.39s! Unfortunately, her compatriots, Omolara Omotosho and Regina George had no such luck as they both failed to make it to the final, after finishing 3rd and 6th respectively. Omotosho competed in Heat 1 and came agonizingly close to automatic qualification; she however missed out on a place in the final as she finished 3rd in 52.34s, trailing Jamaica’s Stephanie McPherson (50.69s) and Kelly Massey of England (52.19s) who beat her near the line as she started to tie up and lose her form in the final straight. More surprising was the performance of Regina George who finished a distant sixth with 53.48s in Heat 3 which was won by the Commonwealth’s top athlete, Novlene Williams-Mills in 50.73s. The Jamaican was followed by defending champion, Amantle Montsho (50.96s) and England’s Margaret Adeoye who returned a time of 52.48s in 3rd. George, the darling of many Nigerian fans could not replicate the form that saw her inspire Nigeria to a bronze medal finish at the inaugural edition of the IAAF World Relays in the Bahamas earlier this year. Rumour has it that the 22-year old was carrying an injury after the heats, and as such couldn’t post a performance deserving of a place in the final. One wonders though why she was picked ahead of Patience Okon George, who finished ahead of her in the National Trials in third place, and really ought to have run the individual 400m, unless she was injured! 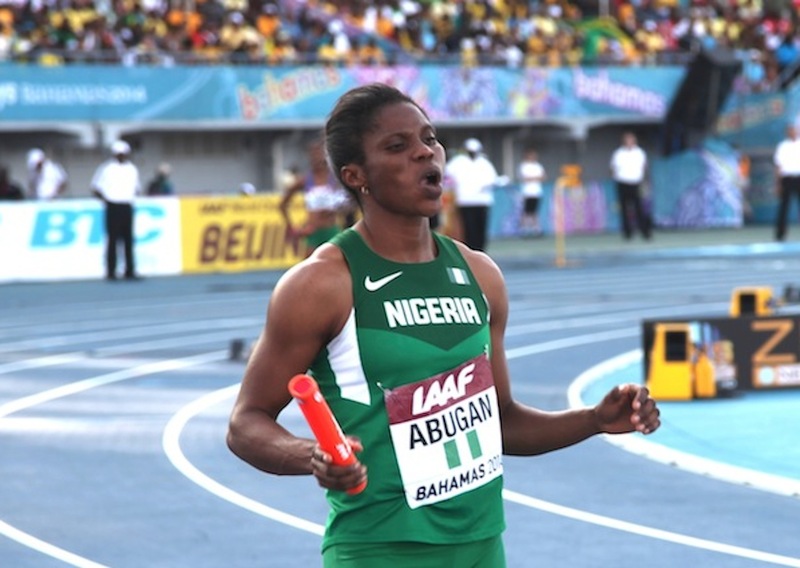 Abugan will be engaged in the battle for supremacy ahead of Tuesday’s final when she goes against a star-studded field which includes Williams-Mills, Day and Montsho (1st, 2nd and 3rd fastest in the Commonwealth this year). She comes to the field with the second slowest time and will need to extra inspiration if she is to get to the podium on Tuesday. As we predicted yesterday, Abugan was the surest bet to reach the final, and is so doing confirms her position as Nigeria’s No. 1 this year. She will have to watch out for the Jamaicans who coincidentally dominated the various heats. Can she pull of the same kind of upset that saw her dethrone Regina George as national champion? ← Blessing Okagbare is 100m Commonwealth Games CHAMPION!